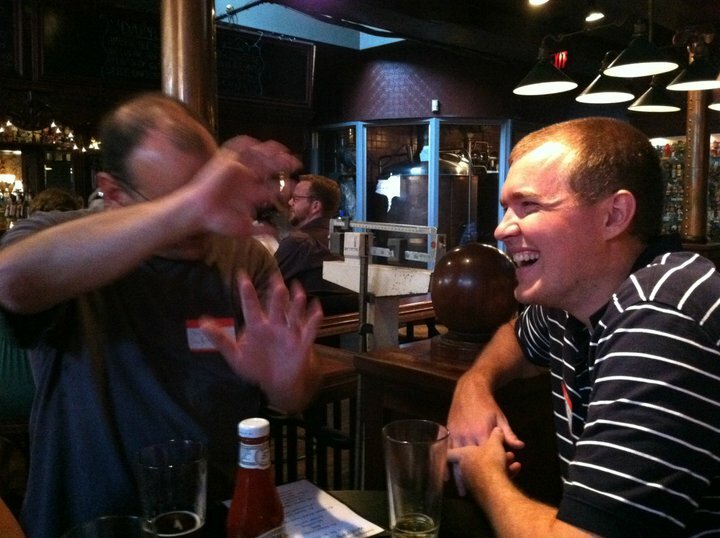 Pulitzer Prize-winning photojournalist Jim MacMillan hiding from Daniel Victor’s iPhone camera to my enjoyment at the August 2011 ONA Philly meetup at Nodding Head. Sometimes you need that kick in the pants from an outsider. My friend, the young sage Daniel Victor, who took a gig at Philly.com under Warren earlier this year after the collapse at TBD, has taken up the cause. Enlisting the Technically Philly crew (hi, that’s me!) and local AP editor Amy Fiscus, Victor is bringing the show back. I’m happy he jump-started the idea, but I’m proud to have been part of bringing this back and expect to play a role for a long time in the future. We had small 20-30 person meetups in July and August and now are moving forward. On Sept. 15, NewsWorks is hosting a show and tell on their near one-year anniversary of work from WHYY, details above at right in sidebar. From what I know, there’s never been a national ONA conference in Philadelphia. That’s something I’d like to see changed. Next Next post: The Golden Ratio by Mario Livio: were mathematics invented or discovered?